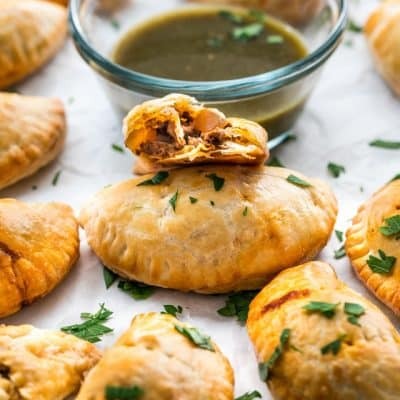 Baked Beef Empanadas made with puff pastry, so easy and so delicious. Don’t underestimate puff pastry, it’s quite versatile and makes some delicious empanadas. Yes we had snow today, and summer isn’t even officially over! Although it melted right away, it still snowed! I don’t know if I’m ready for winter, I know I’m not ready to put my flip flops away. At least my puppy seems to enjoy the cooler weather, considering all the hair he’s got, I bet he can’t wait to play in the snow! But on such cold days I love to bake. I know what you’re thinking, I love to bake all the time, but the need is greater on such days, trust me. On this cold day I decided to remake a classic and favorite of mine, beef empanadas. 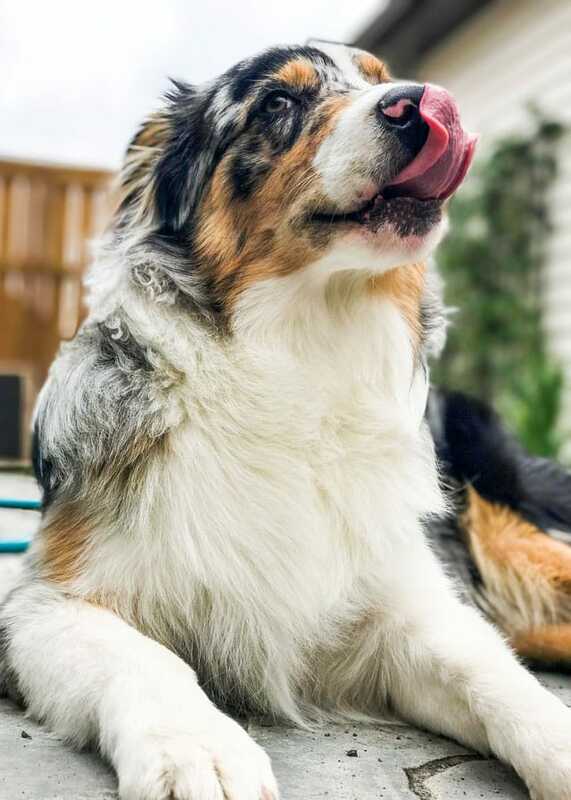 Even Indiana was licking his mouth thinking about them. By the way, Indiana is a boy, as in Indiana Jones, I just have to clarify that because everybody thinks Indiana is just a girl’s name, but come on people, Indiana Jones! Of course I don’t usually introduce him as Indiana Jones, just Indiana or Indy for short, but I always have to explain his name. My husband and I are big Indiana Jones fans, plus I think he looks like Indiana Jones. It was either that or Groot! From Guardians of the galaxy? Are you with me? Let’s talk empanadas though. This time I chose to make them using puff pastry, however I have made my own dough before, you can check it out in my Blueberry Goat Cheese Empanadas, if you’re interested and want to make your own. However, for the sake of keeping things easy, I went with puff pastry which I think is great for empanadas. Don’t underestimate puff pastry, it’s very versatile. I use it every chance I get, and I’ve made some pretty delicious things with it. For these empanadas I used a 4 inch cookie cutter to cut out the rounds, and actually ended up with quite a few empanadas. Don’t throw away the leftover puff pastry, I just re-roll it and make more empanadas. The secret to these empanadas though is that you want a nice and juicy meat filling, not dry, which is why I add some beef broth. The meat mixture is also a bit spicy but feel free to adjust the hot sauce or chili powder to your liking, but I would say these are mild for my taste. These are great served with salsa verde, a queso dip, regular salsa, even a green Sriracha sauce. 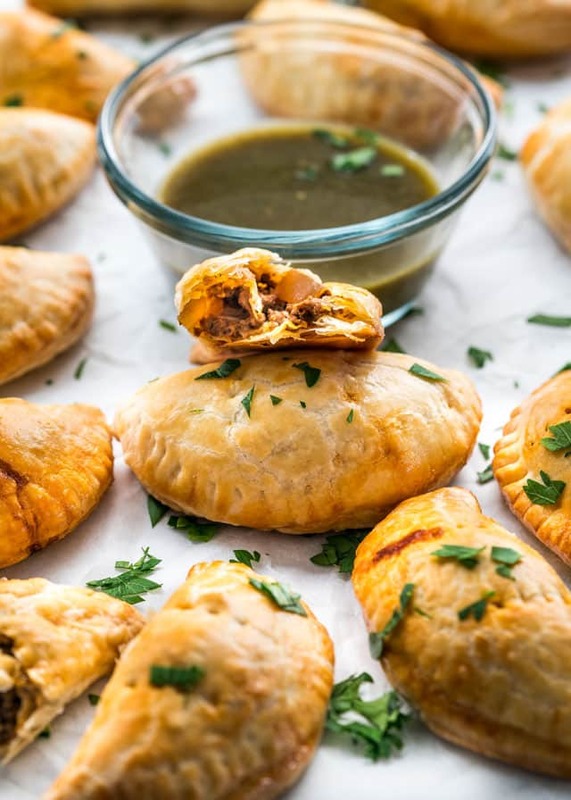 These empanadas are perfect little appetizers and great for any occasion which is why I hope you give these a try, they’re really good! 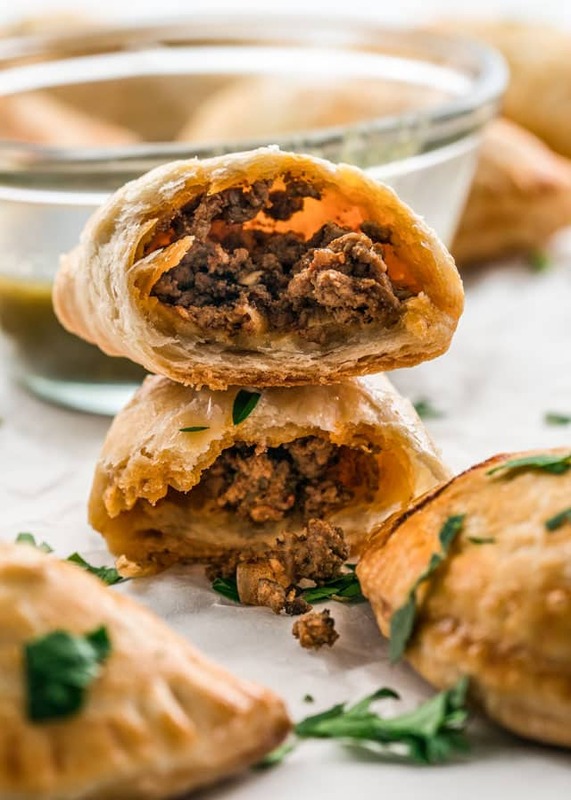 Baked Beef Empanadas made with puff pastry, so easy and so delicious. 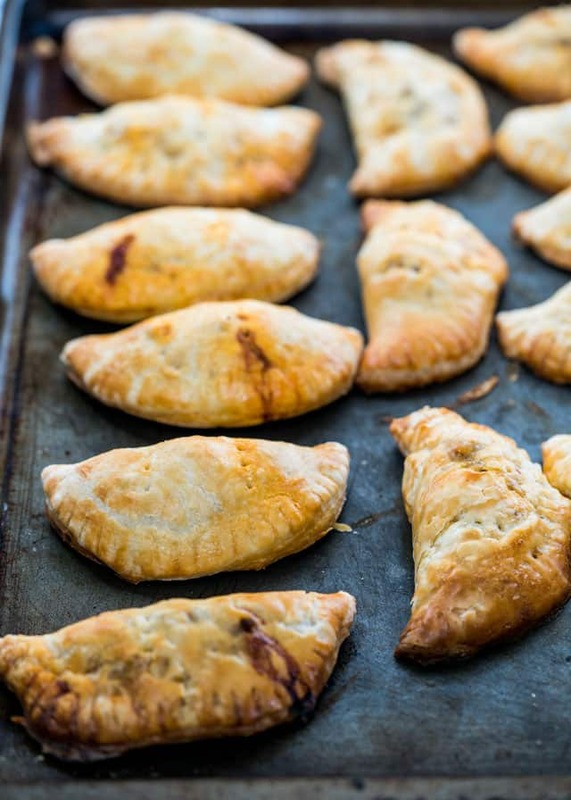 Don't underestimate puff pastry, it's quite versatile and makes some delicious empanadas. In a medium skillet heat the olive oil and add the ground beef. Saute the ground beef until no longer pink, breaking it up with a wooden spoon. Add the onion and garlic to it and continue sautéing until the onion is soft and translucent. Add the oregano, cumin, smoked paprika, chili powder, salt, pepper, beef broth, brown sugar and hot sauce to the skillet and stir. Cook for a couple more minutes then remove from heat and let the meat mixture cool until it comes to room temperature. Working with one puff pastry sheet at a time, roll it out so that it's long enough to cut 6 circles, 2 on each row, see video. Using a 4 inch cookie cutter or bowl, cut 6 circles, 2 per row. Fill each with a about a tablespoon of meat mixture in the middle of each pastry round. Brush half of the pastry round edge with egg wash, then fold the dough over into a half-moon shape so the edges meet and then press them together with your fingers to seal. Use a fork to crimp the edge. Place it onto a baking sheet and repeat with remaining ingredients. You should get around 40 empanadas. See notes. Poke holes in each empanada using a fork then brush the empanadas with the egg wash and bake for about 20 to 25 minutes, or until golden brown. Serve warm with salsa or salsa verde. After cutting rounds from each pastry sheet, reroll the leftover dough and cut it into more rounds, you should get about 10 rounds in total from each pastry sheet. Great recipe. We regularly went to a South American restaurant that after years closed their doors. They had the best empanadas! 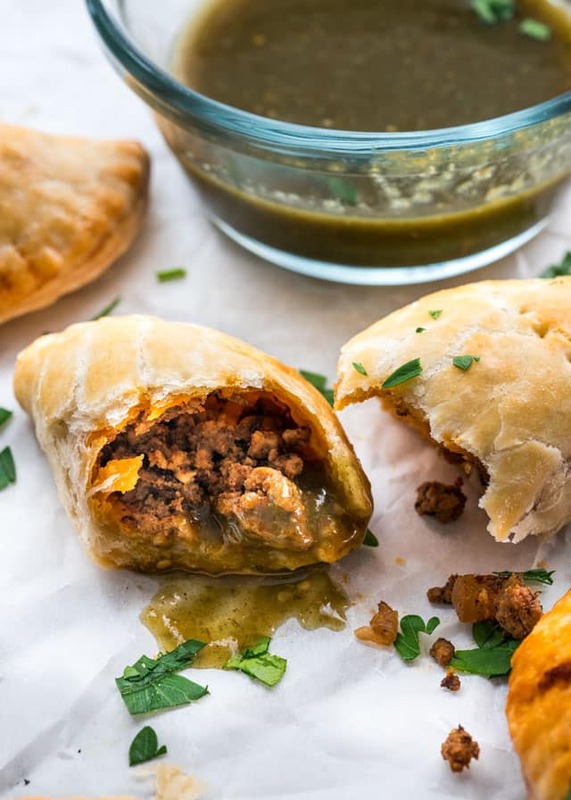 This recipe is as close to those empanadas as we have tasted. Excellent. Kids love them!!! Great flavour and easy to make especially with puff pastry. I made these for a ladies luncheon. They were a great hit! I want to know if they can be frozen both before & after cooking? Should you defrost before cooking also should you defrost before heating again? I made these today and they were so good. Yum!! What is the dipping sauce ? Thinking of making this for the weekend. That is actually green sriracha sauce, got it at Costco. I missed the chili powder when shopping, so I just sprinkled in a little red pepper. The flavor was good. I set my timer for 20 minutes, and at 15min they were VERY well done. I will definitely try again, but I will look for pre made empanada wrappers. I found that when rolling out the extra dough it became very tough. Thank you! I’m going to make these tomorrow for a school function, but also need a vegetarian option. Do you think I could substitute black beans for the ground beef? If so, any ideas on how many cans of beans to use? I’m not sure, haven’t tried with black beans, it might work and 2 cans might be good. I was thinking of a veggie version for a friend and thought i could saute mushrooms and finely dice but bean idea sounds interesting too! What sauce did you make with these?